It's weird that this all started and ended with a flood. But, then again, maybe nothing really started or ended at all. I'm not sure, to be honest. What I can say without a doubt is that there were two floods; one of them directly preceded the news that Ren needed a full spinal fusion and the other happened mere days after he officially graduated from his post-op restrictions. Sure, the back was bad well before the first flood, and it will remain bad well after the second one. Still, two floods in six months is weird. The first flood I read as a sign--a sign that, even though the demise of Ren's spine seemed inevitable, somehow the fact that nothing was damaged when Stow plugged the drain and flooded the bathroom down into the basement proved that everything would be okay. Sometimes we really need to find reasons and reassurances, especially when we are facing something as inconceivable as a full spinal fusion and the sixth spine surgery in six years. Happy Halloween from your friendly neighborhood skeleton! 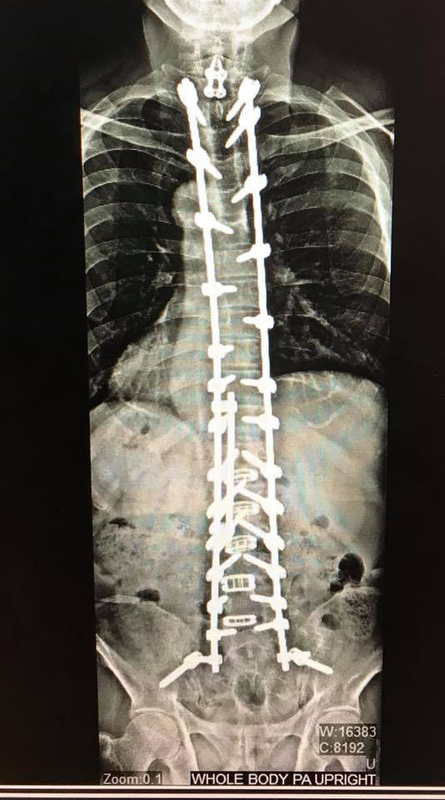 Ren's back post spine surgery #6. The second flood happened on a Saturday morning just a few days after Ren's tight restrictions were lifted. For the first time in months, he didn't have to wear the turtle shell brace and I didn't have to remind him not to bend, lift, or twist (though he will from now and forever be beholden to a 25-pound lift limit which is going to stink at least until one of the kids is strong enough to help me carry things). I'm not going to read this second flood as a sign, though. Somehow that seems too easy. And a bit misguided. I will, however, continue to think that the cupcake container falling on my head when I walked past the refrigerator (causing me to go to the sink and pull out the trash can, thereby discovering water spewing from the pipe) was very, very well timed. And, I'm going to remain very glad that we decided at the last minute that Ren's back couldn't take a 7-hour drive and so did not go to my parents for the weekend. And, I can't help but feel astonished by the fact that although we vacuumed and soaked up several buckets full of water, there was zero damage to the wall or ceiling of the TV room despite the fact that water was pouring down from the kitchen above. It's not that I no longer believe in signs and miracles. I still do. But, the experiences of the last five months have taught me something else. They've taught me that looking so hard for reasons keeps me from seeing all of the good stuff that's happening all around me. It turns out there are many people in our lives who are more than happy to help if we just ask. It turns out it's okay to admit that you can't do everything, and it's even okay not to try. It turns out there are people who love our quirky kids for who they are and who will drop just about anything to be there for them. It turns out we are very, very lucky. I know I should have known this, but I'm a slow learner. So, this side of the second flood, I'm aware that we lost a lot--we lost our sense of normalcy; we lost precious days and months with Ren; Ren lost much of his flexibility and his ability to lift; we lost Ren's mom at a time when we couldn't be there to say goodbye. But, we gained a lot, too. And, for that I am very grateful. Thank you to all of our family and friends who stepped up and stepped in, either in person or virtually. It has meant a lot. You all made this so much better than it could have been, and I'm sure we are better for it.